What are risk factors for scleritis? What are symptoms of scleritis? What are signs of scleritis? How do health care professionals diagnose scleritis? What is the treatment for scleritis? Are there home remedies for scleritis? What are the complications of scleritis? What is the prognosis for scleritis? Is it possible to prevent scleritis? What research is being done on scleritis? Scleritis is inflammation of the white portion of the eye, the sclera. Scleritis is a serious eye disease that is often associated with underlying autoimmune disorders. Prompt diagnosis and treatment of scleritis is essential to prevent permanent vision loss. Scleritis is inflammation of the sclera, the white portion of the eye. The sclera is the tough, white fibrous outer wall layer of the eyeball. It is a type of connective tissue. The sclera provides both the white color of the eye and maintains the shape of the eyeball. It extends from the edge of the cornea (the clear, dome-shaped window in the front of the eye) around to the optic nerve in the back of the eye. Scleritis is an uncommon disease and is differentiated from episcleritis, which is inflammation of the surface membrane covering the sclera and is a more common eye condition. In episcleritis, only the superficial tissue between the white of the eye (sclera) and the blood vessel-filled covering (conjunctiva) is inflamed. Approximately one-half of scleritis cases are associated with underlying diseases that affect the body internally (systemic diseases). Connective tissue disorders, autoimmune diseases, and generalized vasculitic abnormalities may all first appear as scleritis or manifest themselves as scleritis at some other time during the course of the underlying disease. Scleritis may be seen in association with systemic lupus erythematosus, arthritis, other types of inflammatory arthritis (ankylosing spondylitis, reactive arthritis, gouty arthritis, psoriatic arthritis, relapsing polychondritis), polyarteritis nodosa, mixed connective tissue disease, progressive systemic sclerosis (scleroderma), granulomatous polyangiitis, polymyositis, Sjögren's syndrome, giant cell arteritis, inflammatory bowel disease, and allergic angiitis. Scleritis may be the initial manifestation of these underlying illnesses. Some of these conditions are organ-threatening and potentially lethal. Scleritis can also be the result of an infectious process caused by bacteria including pseudomonas, fungi, mycobacterium, viruses, or parasites. Trauma, chemical exposure, or postsurgical inflammation can also cause scleritis. No cause is found in some cases of scleritis. Scleritis may affect either one or both eyes. In patients with disease in both eyes, an underlying systemic cause is almost always found. Scleritis is usually not infectious and, therefore, is not contagious. Infectious scleritis occurs primarily in eyes that have had surgery or trauma. The peak incidence of scleritis is in people aged 40-50 years old. Women are more commonly affected than men. The presence of known autoimmune or connective tissue disease markedly increases the risk of scleritis. Symptoms of scleritis include pain, redness, tearing, light sensitivity (photophobia), tenderness of the eye, and decreased visual acuity. Pain is nearly always present and typically is severe and accompanied by tenderness of the eye to touch. The pain may be boring, stabbing, and often awakens the patient from sleep. The extreme pain of scleritis helps to differentiate it from other common causes of redness of the eyes, such as conjunctivitis or episcleritis. There is usually no discharge from the eye in scleritis. 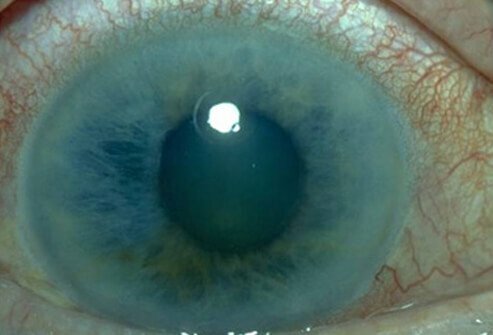 The discoloration that is caused by the inflammation can have a bluish hue and can involve the entire white of the eye or be localized to only one area. Decreased visual acuity may be caused by extension of scleritis to the adjacent structures, leading to inflammation of the cornea (keratitis) or the colored portion of the front of the eye (uveitis), glaucoma, cataract, and abnormalities of the retina. In scleritis, there is redness of the blood vessels adjacent to the sclera. This redness can have a bluish or violet tinge. With repeated episodes or long-standing scleritis, the sclera can thin and the underlying brown choroid may become visible through the residual sclera. Scleritis may be nodular with multiple round or oval elevated areas of the sclera. Scleritis may also be necrotizing, resulting in areas of thinning and softening of the normally fairly rigid sclera. Areas of absence of redness may be due to death (necrosis) of inflamed blood vessels. Scleritis can be characterized as being located in the front or back of the eye (anterior or posterior), depending on the location of the disease upon examination. Visual acuity can be decreased if there is secondary clouding of the cornea or of the lens of the eye. Intraocular pressure can be increased from congestion of the blood vessels involved in draining aqueous fluid from the eye. Intraocular pressure can also be decreased if the ciliary body, which lies deeper than the sclera, is secondarily involved by inflammation. Disturbances of eye movement can be seen since the extraocular muscles can become irritated where they insert into the sclera. This can cause double vision. Many of the conditions associated with scleritis are serious. Episcleritis is a much more common and milder inflammation of the tissue. The extreme pain of scleritis helps to differentiate it from other common causes of redness of the eyes such as episcleritis, which is not as painful. Many of the conditions associated with scleritis are serious. Conjunctivitis is a much more common cause of a red eye. The extreme pain of scleritis helps to differentiate it from other common causes of redness of the eyes such as conjunctivitis, which can cause itching and burning, but is not exceptionally painful. There is usually no discharge from the eye in scleritis while there is often a discharge with conjunctivitis. Necrotizing scleritis is the most severe and destructive form of scleritis, sometimes leading to loss of the eye from multiple complications, or occasionally perforation of the eyeball (globe). In necrotizing scleritis, there is breakdown of the scleral tissue. Ophthalmologists treat scleritis. An ophthalmologist is a medical doctor who has specialized in the diagnosis and treatment of eye disease. Your ophthalmologist may consult with an immunologist or rheumatologist to assist in your treatment depending on the particular situation. Scleritis is usually diagnosed by the history and the clinical findings on slit lamp examination by an ophthalmologist. The slit lamp is a special viewing instrument that eye specialists use to stabilize the head while magnifying and viewing the structures of the eye. In order to determine the cause of the scleritis, blood tests including rheumatoid factor, antinuclear antibodies, antineutrophil cytoplasmic antibodies, human leukocyte antigen typing, and erythrocyte sedimentation rate may be ordered. If infectious disease is suspected, appropriate cultures or serological tests may be necessary. If granulomatosis with polyangiitis is considered, sinus X-rays and a chest X-ray may be ordered. Radiographic examination of joints may assist in the diagnosis of various types of arthritis. If orbital inflammation is suspected in addition to the scleritis, an MRI of the orbit may be helpful for diagnosis. Treatment of scleritis resulting from an underlying disease process usually requires specific therapy for that disease. Topical treatment with eye drops is an adjunct to such systemic treatment. These eye drops will usually be anti-inflammatory, such as topical steroid drops or topical nonsteroidal anti-inflammatory drops (NSAIDs). Topical antibiotics are used if the scleritis is felt to be infectious. In situations where no underlying disease process is found, eye drops to counter inflammation are used, but they are often insufficient to control the process. Systemic treatment with NSAIDs, cortisone medication (corticosteroids), or immune modulating agents such as methotrexate (MTX) can be the first choice. But azathioprine, mycophenolate mofetil, cyclophosphamide, or cyclosporine are also used. Anti-TNF agents such as the biologics infliximab (Remicade) or adalimumab (Humira) can also be used. Localized, subconjunctival steroid injections are often helpful in certain situations or if systemic side effects of these drugs are of concern. The delivery of steroid eyedrops using a low-level electrical current to encourage drug migration into the affected tissue, known as iontophoresis, is currently in clinical trials. Rarely, surgical procedures may be required if there is scleral thinning. In order to preserve the integrity of the eye, scleral grafts available through eye banks can be used. Corneal tissue may also be used if there is perforation or severe thinning in the limbal area. Scleritis is a serious eye disease. There are no home remedies for scleritis. Complications of scleritis include inflammation of the cornea (keratitis), anterior or posterior uveitis, glaucoma, cataract, retinal swelling, scleral thinning, peripheral corneal shinning, and retinal macular swelling. Corneal or scleral thinning, if untreated, may lead to a hole in the side of the eye (ocular perforation) and severe vision loss or blindness. Scleritis may be recurrent. Long-term treatment with corticosteroid eye drops may itself cause cataract and glaucoma. Scleritis is a serious eye disease which must be evaluated, treated, and monitored aggressively to avoid vision loss. Scleritis may be recurrent, but is usually responsive to therapy. It is critical that any underlying disease be diagnosed and treated. Many of the conditions associated with scleritis are serious and may only be diagnosed during the evaluation for the cause of the scleritis. The scleritis itself may respond to treatment, but the underlying disease process may not. In general, scleritis in association with granulomatosis with polyangiitis is difficult to treat and may lead to vision loss even with treatment. The scleritis seen with the spondyloarthropathies is usually very responsive to treatment. Scleritis that occurs in the absence of an underlying disease will typically respond well to treatment. When recurrent scleritis symptoms are noticed, urgent treatment can result in optimal outcome. Scleritis is an inflammation of the white of the eye. It is a serious eye disease which is often associated with underlying autoimmune disorders. Prompt diagnosis and treatment is essential in preventing permanent vision loss. There is no preventive treatment for most cases. Patients with underlying disease processes should be made aware of the possibility of scleritis occurring and should have access to immediate care and careful monitoring by an ophthalmologist. Current research in scleritis is trying to determine the exact immune abnormalities leading to the disease and is searching for more precise medication to target those portions of the immune system. Akpek, Esen Karamursel, et al. "Evaluation of patients with scleritis for systemic disease." Ophthalmology 111.3 (2004): 501-506. Hodson, Kelly L., et al. "Epidemiology and Visual Outcomes in Patients With Infectious Scleritis." Cornea 32.4 April 2013: 466-472. Johnson, Keegan S. and David S. Chu. "Evaluation of sub-Tenon triamcinolone acetonide injections in the treatment of scleritis." American Journal of Ophthalmology 149.1 (2010): 77–81. Watson, Peter, et al. Duane's Ophthalmology, 15th Ed. Philadelphia, PA: Lippincott Williams & Wilkins, 2009. Zamir, Ehud, et al. "A prospective evaluation of subconjunctival injection of triamcinolone acetonide for resistant anterior scleritis." Ophthalmology 109.4 (2002): 798-805. Describe your signs and symptoms of scleritis. Do you have an autoimmune disease that increases your risk of scleritis? Please share your experience. Discuss the events that led to a diagnosis of scleritis. What treatment(s) or medication(s) have you received for your scleritis?